Meet George and Martha Gobbleton from AuryTM Designs. These crazy kids can be found dressing in their holiday best for every occasion. 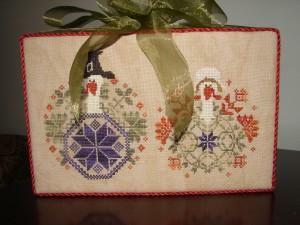 Of course, in this pattern they are ready for Thanksgiving. These two expect to be hanging on your wall and not on your table. They are currently hanging out at Embroidery Central for a sizzling price of $8. So invite them over and create some smiles. Click turkey to get yours now. Remember to like Embroidery Central on Facebook if you want to see everything they have going on.